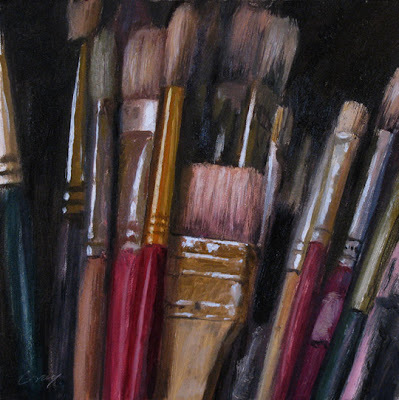 In my studio are numerous cans, jars and buckets full of brushes. I hardly ever throw one away, unless it has just become a stick. Even then, I might keep the stick...never know when you might need a good stick. Great stuff Don! Love the brushes! A beautiful glimpse of our tools of the trade. This is fantastic. Claire, thank you and welcome to the blog. I like it, as always Don. I never throw away a brush or a good stick either. Awesome Work!!! It will be a pleasure to follow your blog! Thanks a lot, Cheryl--and thanks for signing on to follow. Happy painting! Hey Frank--good to hear from you. I'll bet you could use a stick and still do one of your fantastic paintings! Thanks, M. Your new paintings are just gorgeous. Nice texture on the bristles, Don!